So, while he was in Iraq, apparently addressing an audience of service personnel, I heard the President say something to the effect that "The Democrats were all, every one of them, in favor of building the wall, they all agreed we needed a wall, until they found out I was in favor of it." What sort of Democratic support for what sort of wall, when and where, was he alluding to, or did he just make the whole notion up out of whole cloth on the spur of the moment? Not made up out of whole cloth, but not completely accurate either. Democrats did support and vote for the Secure Fence Act of 2006, the text of which can be found HERE. The first link should tell you who voted for it, but right now it says the site is down for maintenance. Rvaughn wrote: Not made up out of whole cloth, but not completely accurate either. Democrats did support and vote for the Secure Fence Act of 2006, the text of which can be found HERE. The first link should tell you who voted for it, but right now it says the site is down for maintenance. Not sure the Secure Fence Act of 2006 was what Trump had in mind. But if that was it, he certainly lied about how many Democrats were against it (18 were against it and 1 Republican) Thanks Jon! Also reading the Act itself, it only called for Fencing (not a Wall) and only extended 5-15 miles East and West from 5 port of entries. Trump usually exaggerates (often massively) any number when it is a political hot point. Now Trump may have had mind the offer Schumer temporarily made of $25M for a southern wall in exchange for freedom for the Dreamers in the Jan 2018 shutdown battle. No one even voted on that idea suggestion. The Democrats were all, every one of them, in favor of building the wall, they all agreed we needed a wall, until they found out I was in favor of it. Trump also told the troops that he has given them their only raise in ten years. Trump misleads about military pay raises again. With inflation included look at plot in https://www.motherjones.com/kevin-drum/2018/12/trump-lies-to-troops-faces-about-pay-raise-he-gave-them/. Too large to post here easily. 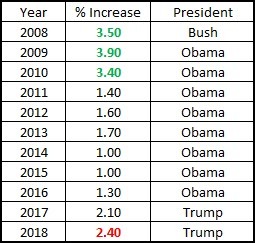 Yes inflation is happening again since Trump has been in office. Inflation rate history. That (among many other indicators) is why the Fed is increasing rates. The President is full into the Post-truth era, which means if you want something to be true, it must be. His justification is “People Believe me"
Just a reminder: As of Nov 2018 Trump has lied 6240 times publicly and it is accelerating. KeithE wrote: Not sure the Secure Fence Act of 2006 was what Trump had in mind. But if that was it, he certainly lied about how many Democrats were against it (18 were against it and 1 Republican) Thanks Jon! So which politician do you support that has not told a lie? Intentional or not. If you wAnt to make that a standard for not being allowed to serve or trust... I am not sure who you could nominate. If it a certain number of lies that must be said before being guilty of lying, please tell me that number. Tell me one and if they are on the ballot next time, I’ll vote for them. Thanks, indeed, Jon. Technically 17 Democrats, since Leahy was from Vermont. [Belated correction: it was Jefford, not Leahy, who vas the Independent from Vermont. The Green Mountain Boys seem to tend towards the nonpartisan Left. Bear in mind, that is not a quotation from Trump's mind, but rather my hours-later-from-memory reconstruction of roughly what he said as I recalled it. I'd love to see a transcript of the actual utterance or a YouTube so I could make my own. The President is full into the Post-truth era, which means if you want something to be true, it must be. I'm not sure he even bothers with wanting it, he flipflops so gracefully from tweet to tweet. The promise was "We are going to build a wall and Mexico will pay for it." Not happening. Mexico isn't paying for it. So the orange hair can't deliver on one of his most often cited promises. That's been the story of his presidency so far. But on this issue, the trump lies go all the way back to the beginning, when he started talking about the need for border security. None of his perceptions are the reality. The Democrats not only favored increased border security, but they brought it about during the Obama administration. A combination of beefed -up border patrol, looking in the places where illegal workers were working, enforcing employment documentation policies, and deporting those who were here illegally. And there is a major difference between illegals coming across the border to work, and refugees coming across the border claiming political assylum. Trump's obvious prejudice against Latinos causes him to confuse the two separate issues. Sans context in the address, I can't say for sure he meant the Secure Fence Act of 2006, but there is context otherwise. I have heard this cited several times recently as evidence that Schumer, Obama, Clinton were for this concept and that Democrats have changed their tune on border security. IIRC, one who said this was someone is Trump's cabinet. Fencing, true, but also called "physical infrastructure enhancements to prevent unlawful entry by aliens into the United States..." -- so much in common in spirit with the wall idea, right? KeithE wrote: Also reading the Act itself, it only called for Fencing (not a Wall) and only extended 5-15 miles East and West from 5 port of entries. 10 miles west and east of the Tecate, California, so 20 miles there. 10 miles west of the Calexico, California, to 5 miles east of the Douglas, Arizona -- don't know, maybe 300 or 400 miles down the border? So altogether it looks like the 80 "yeas" (D & R) voted to fund roughly 700 miles of border security fencing. My senators were both Nays. But yes, it certainly seems forgetful of lots of Democrats to take the approach they currently are on the Wall. But then, Clinton and Obama are certainly Johnny-come-latelies to their current position. Haven't followed Schumer enough to know, but I'd be surprised if he differed from them much. It does seem clear that what I heard Trump tell the troops was an exaggeration, but not the absurdity I thought it was. Keith’s responses in this color. OK, but who/what is “IIRC”? It does appear that Schumer and HRC voted for this Act and Obama signed it. But this Act is not nearly as severe as what Trump currently wants. Much (not all) of the current argument between Dems and Trump is the nature of that “Wall” and it’s extent. Dems rightfully say the high physical Wall over the whole Southern Border that Trump has usually demanded is too costly (estimates range from $21.6B to $70B not including land acquisition) and ineffective in “prevent(ing) unlawful entry by aliens into the United States” - one can dig under, bore a hole or use explosives to penetrate. Dems are (for the most part) wanting border entry control and policing and want what the experts say and border agents say are proven border control measures, namely more agents, surveillance, canine sniffers, and patrol boats. I’m sure there are a few that want what Trump claims 'Dems, everyone of them, want open borders'; but not many. The manner of border control and its humanity is what is at issue. No Trump’s answer for border security is not in the “spirit” of the construction experts, the border agents, or common sense. It is in the “spirit” of RW xenophobic politics that his rhetoric preyed on. He would do far better for himself politically if he asked for $5M of additional to-be-specified border security/humanitarian aid at the border/economic aid for the Northern Triangle. It might even end this partial shutdown. "The Democrats were all, every one of them, in favor of building the wall, they all agreed we needed a wall, until they found out I was in favor of it." BTW, the total Mexico/US border is 1984 miles, 30 of which is over water. In 2007 DHS complained that differing terrain called for different means and the act was amended. Read this - it tells the story of the lack of implementation of this Act including a lie told by Obama at a rally. Sorry for the late additions - I was called away to drive my grandson home. I heard on my way back that Trump is now demanding only $2.5B but still that Wall (at best funding 1/10th of that Wall from Ocean to Gulf). KeithE wrote: OK, but who/what is “IIRC”? It does appear that Schumer and HRC voted for this Act and Obama signed it. But this Act is not nearly as severe as what Trump currently wants. IIRC stands for "If I Remember Correctly." No, on the other -- Schumer, Hillary Clinton, and Barack Obama voted for this Act and George Bush signed it. To me its seems that much of the argument between Dems and Reps is and has been political posturing. They all for years talk about immigration reform and when they have had the opportunity to do something (owning House, Senate, Pres) they have not done it. So that makes me think of plying for votes as opposed to true fealty to what they claim. KeithE wrote: No Trump’s answer for border security is not in the “spirit” of the construction experts, the border agents, or common sense. It is in the “spirit” of RW xenophobic politics that his rhetoric preyed on. He would do far better for himself politically if he asked for $5M of additional to-be-specified border security/humanitarian aid at the border/economic aid for the Northern Triangle. It might even end this partial shutdown. The "spirit" I am talking about is not Trump's, neither anything to do with him, but rather the elements that "wall" and "fence" share in common as "physical infrastructure enhancements to prevent unlawful entry by aliens into the United States." And a far cry from the "fifteen miles" you posited, too. KeithE wrote: BTW, the total Mexico/US border is 1984 miles, 30 of which is over water. In 2007 DHS complained that differing terrain called for different means and the act was amended. Read this - it tells the story of the lack of implementation of this Act including a lie told by Obama at a rally. How much of the fence they have finished or not finished doesn't change the fact that 80 senators voted for it. So those 80 must have thought it was a good idea at the time (or maybe they thought it would look good for when they campaigned for reelection). As far as the 2007 amendment, that was basically to put the details of the erection of the fence under the discretion of the DHS (Department of Homeland Security), which seems sensible to me. According to the New York Times by April 2009 "the Department of Homeland Security has erected about 613 miles of new pedestrian fencing and vehicle barriers to thwart illegal border crossers and drug smugglers trying to enter the United States" and that "construction is beginning on two new sections of the fence, one through the Rio Grande Valley near Brownsville, Texas, and another in the Otay Mountain Wilderness in California's San Diego County." Sounds like about 1/3 has some sort of barrier. Jon Estes wrote: So which politician do you support that has not told a lie? Intentional or not. If you wAnt to make that a standard for not being allowed to serve or trust... I am not sure who you could nominate. If it a certain number of lies that must be said before being guilty of lying, please tell me that number. Can you name a President in your lifetime that has never lied? Tell me one and if they are on the ballot next time, I’ll vote for them. Not specifically related to anything in this thread, but an interesting example of how absolutes change depending on who is the President. No one is perfect, including certain Baptist pastors (and their church members too) but President Obama and his administration's honesty and integrity stand so far above the corruption and dishonesty of Trump, it's not even a fair comparison. KeithE wrote: BTW, the total Mexico/US border is 1984 miles, 30 of which is over water. BTW, besides that 30, the entire Texas-Mexico border is divided by the water of the Rio Grande. According to TXDOT, the Texas-Mexico border is 1254 miles long. As I understand it the border is in the middle of the riverbed. This creates some unique problems for fencing, walls, barriers or whatever. According to USA Today the "Texas border is mostly unfenced because of treaty provisions, private-property rights, litigation and floodplains. Fencing was easier to build in New Mexico, Arizona and California, where the federal government controls a 60-foot-wide strip of land adjacent to the border." When you see some of the terrain in places on the Texas-Mexico border (obviously not all of it), it seems to me that what is already there would be harder to cross than a fence or wall! This National Geographic photographer (not a proponent) supplies pictures of some walls, fencing, and barriers that already existed in September 2017 on the U.S.-Mexico border. We used to take our ninth grade class out to Big Bend National Park for a few days at the beginning of the school year to help build relationships and to see some things that kids who lived in the Houston suburbs normally didn't get a chance to see. One of the best features of Big Bend is its emptiness and the fact that there are some place that are really remote. Our longest hike was a four or five hour treck along the river through Boquillas Canyon. It's about as remote a place as you can get, yet about four or five miles up the trail, you are across the river from the little Mexican town of Boquillas. There is no bridge across the river, but when we made the trip it was usually during a dryer season and you can get across the river into Boquillas by stepping on the right rocks and maybe taking your shoes off and wading for 15 or 20 yards. But the remote nature of the area is probably why there aren't a lot of illegal crossings that take place there. To get to Boquillas from the Mexican side is a three hour ride over bad roads. Once you cross into the US, there's 60 miles of desert in a national park to cross before you get to a settled area. Abbreviated internet jargon again, For What It's Worth, followed by a winking ASCII emoticon. It is a part of this thread if people, not I, want to make lying an issue. Your comments on Pbama are really funny. Jon Estes wrote: It is a part of this thread if people, not I, want to make lying an issue. This thread is about the President’s lying (see first post in thread). Just one particular lie out of 7546 lies as of Dec 20, 2018 and counting. Interesting... the lack of others lying has no place in this personal rant on the current Presidents lies. The bias is obvious... as if I need to even mention it. Jon Estes wrote: Your comments on Pbama are really funny. Yes, I guess most evangelical right wingers do find honesty, morality, integrity and scandal-free politicians something to laugh at, now that they have switched over to support for adulterous, lying, immoral, strip-club owning bigots and abandoned conventional, conservative morals and ethics. What the president did in that speech was, put simply, to lie — claiming to have built the "fence" that Republicans enacted into law, without noting that he and his fellow Democrats in Congress changed it to require much less effective fencing. This “fence” was not at all complete - a bald face lie. Late in Obama’s campaign, RWers created a list of 50 supposed Obama lies. But Snopes Fact Checked this and found most were not really lies at all. This makes for interesting reading. READ IT! As for his term as president, the Washington Post reviewed 250 supposed false statements by Obama and only found 10 "Four Pinochios" lies. Read Obama’s biggest whoppers. This may cost you $1 to access. And even at that I could not find how many Three, Two and One Pinochio’s lies by Obama. But the magnitude of the lying Trump habitually does is something you must recognize if you have an ounce of objectivity. Who is “biased”??? Trump's credibility is hanging by a very thin thread (a fact that the world sees clearly). The lie totals range from 6240 to 7546 and it is accelerating (2.9/day lies in 2017 and 8.9/day in 2018). Trump is a pathological liar, among a long list of other things that are demonstrations of immoral character and complete lack of ethics. To attempt to compare him to President Obama, who ran a scandal-free administration with a level of honesty and integrity worthy of the United States of America is a clear example of bias against Obama, and a joke. The only other American president in the same category with a low life like Donald Trump is Richard Nixon and maybe Warren Harding.